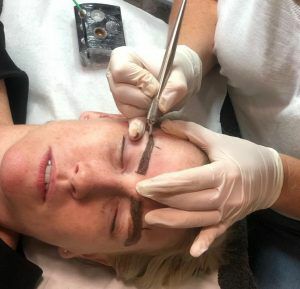 So basically, microblading is a tattooing technique that uses a small handheld machine (a bit like a thick pen) made of several tiny needles which are used to add semi-permanent pigment to the skin. Like a tattoo, basically. Each individual hair stroke is created by hand to produce a thin, natural-looking line that blends in with existing eyebrow hair, whereas eyebrow tattoos are done with a machine and needle, often producing thicker, less natural lines that tend to expand over time. 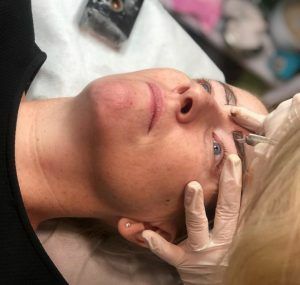 Microblading deposits pigment into the upper region of the skin layers, so it fades more rapidly than traditional tattooing techniques, which deposit pigment deeper and registered microblading therapists are not tattoo artists and vice versa! The end look is natural and as close to normal eyebrows as you can get. To get ready for microblading numbing cream is applied to the brows for 20 minutes prior to the procedure and constantly during the procedure as well. I was really nervous about the pain and was actually sweating by the time I wound up on the bed. I do not know why I always panic so much but I do – and once the treatment commences I wonder why I panicked so much, to begin with, I just can’t help it! The first part of the procedure involves mapping of the brows, which is a highly technical, and involves a compass and protractor – a bit like maths in Grade 8, and allows the therapist to draw on to the skin where the brows should start and end – allowing the client to also say if they are happy with the planned outline for where the brows will be added. Brows can be done in different colours from light to dark, and to any size and thickness that you prefer. 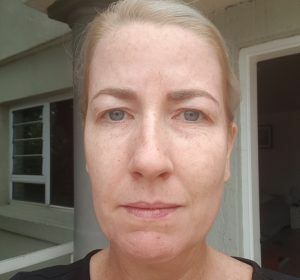 I literally requested that the original shape of my brows is followed and that they just be lengthened slightly – as my brows were a bit short, the one was actually shorter than the other as I tended to sleep on one side more than the other side and over the years it had rubbed it shorter. I wanted a very natural look – I hate being asked if I have had work done! Once Ashleigh and I had agreed on the brows the blading commenced. The machine features a small flat blade and makes a slight ‘bzzt’ noise but nothing too weird. On a pain scale (considering that I find waxing painful) this is maybe a 2 or 3 out of 10. It’s actually more uncomfortable than painful – really. On occasion a small stroke was quite sore – but as a whole, the 45 minutes progressed quickly and I was happily distracted by some of the other therapists popping in to chat (at my request as I know them) to keep my mind off things and take pictures. Once completed Ash applied a thick layer of Dermaheal cream to the brows and I was also given a tube of “Fougera” which is a Vit A & D rich cream that I was given strict instructions to wipe the brows with a cotton pad dipped in warm water and then apply the Fougera cream as often as possible on the day after the treatment, and then for the 5 days proceeding the treatment, three times a day. I was also told not to scratch any scabs off – for obvious reasons – as permanent marking can occur. By the time I got to lunch, you could not see that I had had work done, other than a slight redness, and the brows felt tight and slightly tender. The next two days they started and continued itching, and I made sure to follow the cream application routine and to rather just tap my brows or ‘poke’ them with my fingernails to alleviate the itchiness. I will be going back in 6 weeks time for my touch up – so will update this article again, at that time. 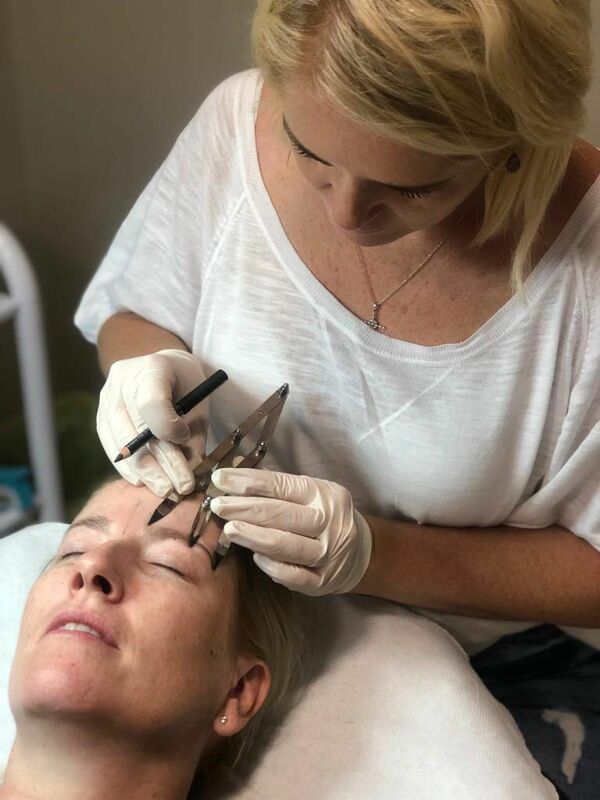 The team at Meraki are experienced at not only microblading but other treatments such as peels and threading, Mani’s and Pedi’s, slimming treatments, spray tans and also have a registered doctor administering botox and fillers on site as well. They are literally my one stop shop for all my beauty and aesthetic needs! *First article addition 13/2/2019 – Day 5 post-treatment. My brows are soooo itchy as they heal. The itching started on Day 2 after the treatment and has stayed since. I am really careful not to scratch as I warned about the scabs, so tend to poke with my finger nails or a tooth pick to alleviate the itch. Some of the scabs started coming off, so I had some flakes in my brows on Day 4 – but I lightly brushed them out with an old tooth brush, and that seemed to do the trick on the fluffy side.